Cholangitis is a term referring to inflammation of the bile duct. Cholangiohepatitis means inflammation of the bile ducts, gall bladder and surrounding liver tissue. "CCHS often has a preceding or coexisting condition." There are numerous causes and contributory factors involved with CCHS. CCHS often has a preceding or coexisting condition such as inflammation of the bile ducts, gallstones, pancreatitis, inflammatory bowel disease (IBD), or chronic interstitial nephritis (CIN - a form of kidney disease). Many cases of CCHS are suppurative, caused by a bacterial infection of the gall bladder with subsequent obstruction of the bile duct from mineralized deposits or swelling. Nonsuppurative CCHS may be caused by immune-mediated disease (a condition where the body attacks itself; in this case, the tissues of the gall bladder or bile ducts are attacked), by the proliferation of tissues that partially or completely block the bile ducts or by tumors. Your veterinarian will discuss the specifics of your cat's problem based on the results of diagnostic testing. What are the clinical signs of cholangitis? The clinical signs associated with CCHS depend on the type of CCHS present. In suppurative CCHS, the clinical signs are more severe and sudden. Cats with suppurative CCHS often have painful abdomens, a high fever, anorexia, collapse and vomiting. Cats may be jaundiced (yellowish discoloration of the skin, eyes, gums and mucous membranes). Nonsuppurative CCHS cases have more ambiguous, chronic symptoms. These cats often experience periods of vague clinical illness such as lethargy, vomiting, anorexia, and weight loss. Most cases of nonsuppurative CCHS will have a normal physical examination. If the bile ducts become small because of CCHS (ductopenia), the cat may have an increased appetite since it is unable to digest foods properly. It is important to rule out other diseases that may be contributing to the clinical signs or causing CCHS. A thorough medical history and physical examination are the first step in diagnosing CCHS. If CCHS is suspected, blood and urine tests are performed. Thyroid hormone levels (thyroxin) are normally measured to rule out hyperthyroidism as a cause of elevated liver enzymes. Pancreatic function tests (trypsin-like immunoreactivity or TLI test), cobalamin and folate levels are often evaluated to search for underlying sub-clinical pancreatitis that may be causing CCHS. Abdominal radiographs are often performed, but may appear normal in some cats with CCHS. 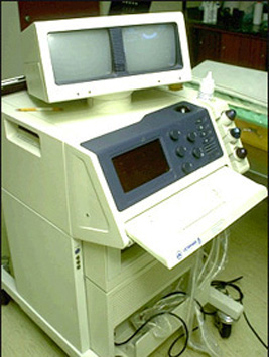 Abdominal ultrasound is considered the best way to diagnose CCHS. An ultrasound-guided fine needle aspiration of the gall bladder or an ultrasound-guided biopsy may be done to evaluate the bile or look for abnormal cells or evidence of infection. Another diagnostic test that may be recommended is a laparotomy or exploratory surgery; surgery is beneficial when bile duct obstruction is suspected. What is the treatment of CCHS? Treatment depends on the cat's clinical signs and the underlying cause. The initial treatment involves stabilizing the cat and providing supportive care such as intravenous fluids, feeding through a feeding tube (see handouts on Tube Feeding and Fatty Liver Syndrome), and antibiotics. 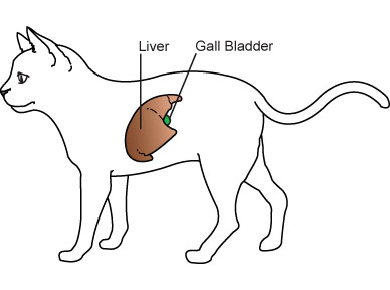 Surgery may be required in cats with bile duct obstruction. Additional drugs and therapies may be recommended based on your cat's specific condition. What is the prognosis for a cat diagnosed with CCHS? With suppurative CCHS, the prognosis is good with timely diagnosis and appropriate treatment, and in some cases the condition may be cured. With nonsuppurative CCHS, chronic, long-term remission is the therapeutic goal, and the prognosis depends on the severity and specific underlying cause or causes.